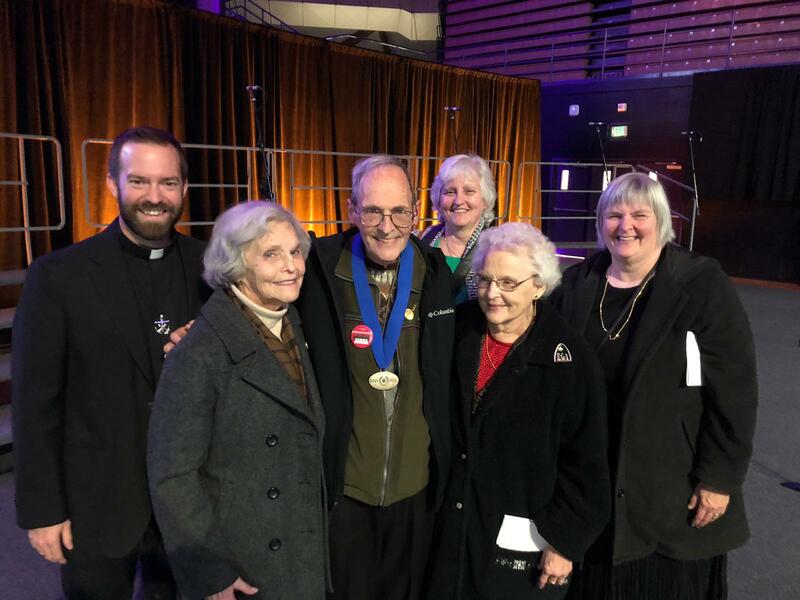 PORTLAND, Ore. - On November 15, 2018, at the University of Portland, Dr. Rami Nashashibi was awarded the prestigious 2018 Opus Prize for his inspirational work as founder and director of the Inner-City Muslim Action Network (IMAN) in Chicago, Illinois. IMAN is a nonprofit organization that fosters health, wellness, and healing in some of the Chicago’s most challenged neighborhoods. Opus Prize finalists, Daniel and Avitha Victor of Agape Rehabilitation Centre in Chennai, India, and Rev. Daniel Panchot, C.S.C., and Jose Antonio Patron of Yancana Huasy in Lima, Peru were awarded $100,000 each. and great nephew, Fr. Tim Mouton, C.S.C., on Thursday, Nov. 15, 2018 at the Opus Prize Ceremony. and José Antonio Quispe Patrón, Executive Director, and his family. The Opus Prize is one of the world's largest faith-based awards for social entrepreneurship and University of Portland students and faculty partnered with the Opus Prize Foundation to select finalists for the 2018 awards. Each year the Opus Prize Foundation chooses one Catholic university to help it award one $1 million and two $100,000 prizes recognizing individuals who are addressing persistent and pressing social problems. From improving education in Afghanistan to supporting the families of incarcerated women in New York City, Opus Prize laureates are motivated by remarkable faith to create new opportunities for transformation and impact. While the Opus Prize Foundation partners with Catholic universities to award the Opus Prize, the individual or organization receiving it may have roots in any faith. You can view the 2018 Opus Prize award ceremony via the YouTube video below. The portion of the ceremony dedicated to Yancana Huasy starts at 01:19:23. Established by Fr. Panchot and led today by José Antonio Patrón, Yancana Huasy works to integrate children and families with special needs into public schools, faith communities and neighborhoods. In the spring of 1981, a small group of Peruvians with motor disabilities, sought help from Fr. Panchot, a Holy Cross priest working in the urban neighborhoods of Lima. Faithful to the Congregation's charism to serve as educators of the faith in mind and heart, with a preferential option for the poor, Fr. Panchot established Yancana Huasy, which has become one of Peru's premier non-governmental organizations. 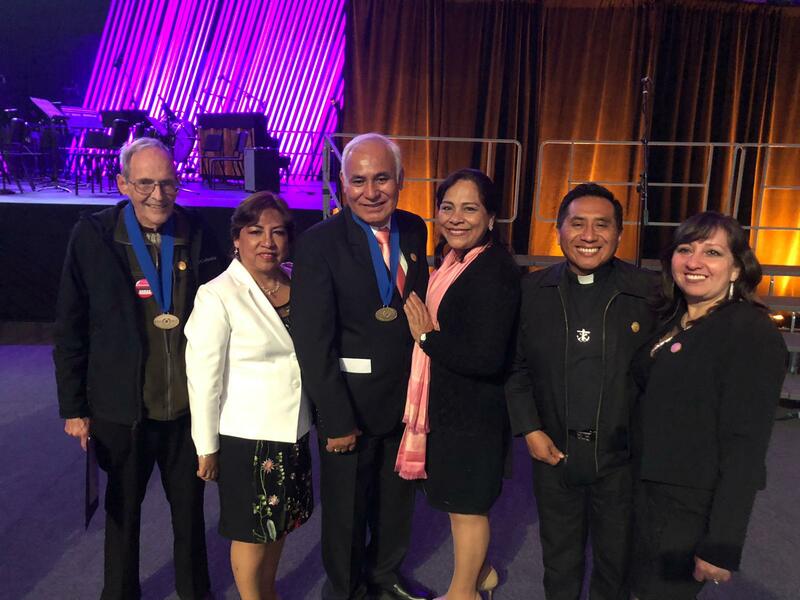 Below, please see a video on the work of the Congregation of Holy Cross, United States Province of Priests and Brothers in the District of Peru, including Yancana Huasy. Led today by José Antonio Patrón, Yancana Huasy works to integrate children and families with special needs into public schools, faith communities and neighborhoods. They are primary advocates in ensuring that the disabled have access to public transportation and handicapped accessibility in public buildings. Much of their focus is on training parents of children with disabilities to meet the physical and emotional needs of their child. Yancana Huasy's staff, many who have worked there for more than 20 years, live each day by the belief that "...it takes a special parent to care for a child with special needs." It also takes special healthcare providers who are changed a very real way, having worked and volunteered at Yancana Huasy. Please enjoy two reflections from Dr. Joseph Paul Dutkowsky, MD, a pediatric surgeon from Cooperstown, New York. While in Peru, Dr. Dutkowsky focused on the medical needs of the physically and mentally challenged children of Yancana Huasy. Thank you for your interest in Yancana Huasy and the Holy Cross Mission Center. To discover the different ways you can offer financial assistance to ministries like Yancana Huasy, please visit our Mission Center Ways to Give Page.